This article is about the public transport network in Hong Kong. For the company that operates it and other networks worldwide, see MTR Corporation. For other uses, see MTR (disambiguation). Under the government's rail-led transport policy, the MTR system is a common mode of public transport in Hong Kong, with over five million trips made in an average weekday. It consistently achieves a 99.9 per cent on-time rate on its train journeys. As of 2014, the MTR has a 48.1 per cent market share of the franchised public transport market, making it the most popular transport option in Hong Kong. The integration of the Octopus smart card fare-payment technology into the MTR system in September 1997 has further enhanced the ease of commuting on the MTR. Construction of the MTR was prompted by a study, released in 1967, commissioned by the Hong Kong Government in order to find solutions to the increasing road congestion problem caused by the territory's fast-growing economy. Construction started soon after the release of the study, and the first line opened in 1979. The MTR was immediately popular with residents of Hong Kong; as a result, subsequent lines have been built to cover more territory. There are continual debates regarding how and where to expand the MTR network. As a successful railway operation, the MTR has served as a model for other newly built systems in the world, particularly urban rail transit in China. During the 1960s, the government of Hong Kong saw a need to accommodate increasing road traffic as Hong Kong's economy continued to grow strongly. In 1966, British transportation consultants Freeman, Fox, Wilbur Smith & Associates were appointed to study the transportation system of Hong Kong. The study was based on the projection of the population of Hong Kong for 1986, estimated at 6,868,000. On 1 September 1967, the consultants submitted the Hong Kong Mass Transport Study to the government, which recommended the construction of a 40-mile (64 km) rapid transit rail system in Hong Kong. The study suggested that four rail lines be developed in six stages, with a completion date set between December 1973 and December 1984. Detailed positions of lines and stations were presented in the study. These four lines were the Kwun Tong line (from Western Market to Ma Yau Tong), Tsuen Wan line (from Admiralty to Tsuen Wan), Island line (from Kennedy to Chai Wan Central), and Shatin line (from Tsim Sha Tsui to Wo Liu Hang). The study was submitted to the Legislative Council on 14 February 1968. The consultants received new data from the 1966 by-census on 6 March 1968. A short supplementary report was submitted on 22 March 1968 and amended in June 1968. The by-census indicated that the projected 1986 population was reduced by more than one million from the previous estimate to 5,647,000. The dramatic reduction affected town planning. The population distribution was largely different from the original study. The projected 1986 populations of Castle Peak New Town, Sha Tin New Town, and, to a lesser extent, Tsuen Wan New Town, were revised downward, and the plan of a new town in Tseung Kwan O was shelved. In this updated scenario, the consultants reduced the scale of the recommended system. The supplementary report stated that the originally suggested four tracks between Admiralty station and Mong Kok station should be reduced to two, and only parts of the Island line, Tsuen Wan line, and Kwun Tong line should be constructed for the initial system. The other lines would be placed in the list of extensions. This report led to the final study in 1970. In 1970, a system with four lines was laid out and planned as part of the British consultants' new report, Hong Kong Mass Transit: Further Studies. The four lines were to be the Kwun Tong line, Tsuen Wan line, Island line, and East Kowloon line. 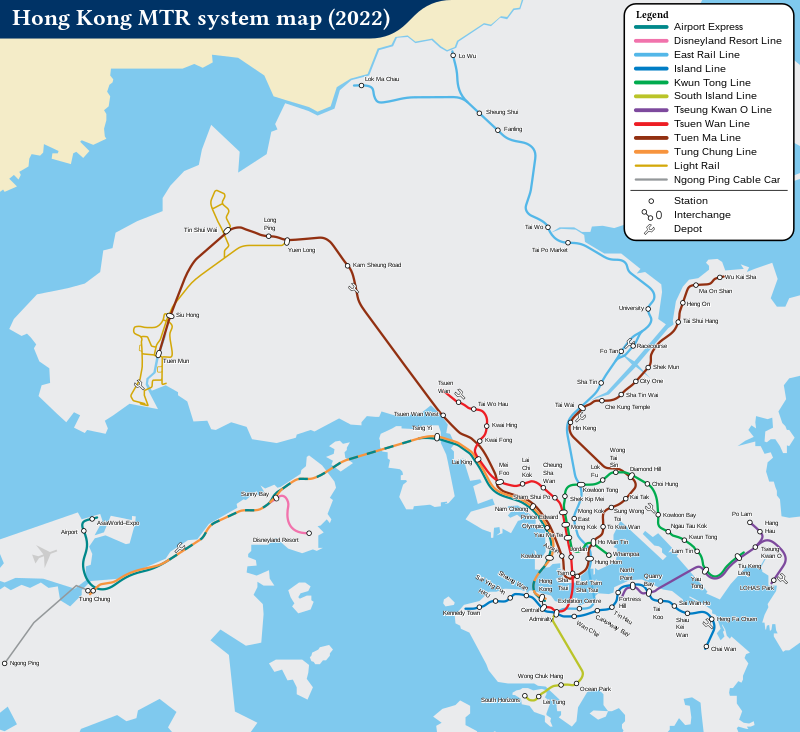 However, the lines that were eventually constructed were somewhat different compared to the lines that were originally proposed by the Hong Kong Mass Transport Study. In 1972, the Hong Kong government authorised construction of the Initial System, a 20-kilometre (12 mi) system that roughly translates to today's Kwun Tong line between Kwun Tong and Prince Edward, Tsuen Wan line between Prince Edward and Admiralty, and Island line between Sheung Wan and Admiralty. The Mass Transit Steering Committee, chaired by the Financial Secretary Philip Haddon-Cave, began negotiations with four major construction consortia in 1973. The government's intention was to tender the entire project, based on the British design, as a single tender at a fixed price. A consortium from Japan, led by Mitsubishi, submitted the only proposal within the government's $5 billion price ceiling. They signed an agreement to construct the system in early 1974, but in December of the same year, pulled out of the agreement for reasons stemming from fears of the oil crisis. Several weeks later, in early 1975, the Mass Transit Steering Group was replaced by the Mass Transport Provisional Authority, which held more executive powers. It announced that the Initial System would be reduced to 15.6 kilometres (9.7 mi) and renamed the "Modified Initial System". Plans for a single contract were abandoned in favour of 25 engineering contracts and 10 electrical and mechanical contracts. On 7 May 1975 the Legislative Council passed legislation setting up the government-owned Mass Transit Railway Corporation (MTRC) to replace the Mass Transport Provisional Authority. Construction of the Modified Initial System (now part of the Kwun Tong line and Tsuen Wan line) commenced in November 1975. The northern section was completed on 30 September 1979 and was opened on 1 October 1979 by Governor Murray MacLehose. Trains on this route ran from Shek Kip Mei station to Kwun Tong station, initially in a four-car configuration. The first train drivers were trained on the London Underground. The route from Tsim Sha Tsui station to Shek Kip Mei station opened in December 1979. The first line was designed by a consortium of consultants led by Freeman Fox and partners. On later extensions to the railway the stations were designed under the supervision of Roland Paoletti, the chief architect at MTR. In 1980, the first harbour crossing was made by an MTR train as the Kwun Tong line was extended to Chater station, since renamed Central station. Trains were extended to six cars to accommodate an increase in passenger numbers. The government approved construction of the Tsuen Wan line in 1977, then known as the Tsuen Wan Extension, and works commenced in November 1978. The project added a 10.5-kilometre (6.5 mi) section to the MTR system, from Prince Edward to Tsuen Wan. The line started service on 10 May 1982 with a total cost of construction (not adjusted for inflation) of HK$4.1 billion (US$526 million). The plan was modified from that in the 1970 report Hong Kong Mass Transit: Further Studies, with Kwai Chung station, Lap Sap Wan station, and a planned depot at Kwai Chung next to Lap Sap Wan station being replaced by stations at Kwai Hing and Kwai Fong and a depot at Tsuen Wan. Several stations also had names different to that during planning: So Uk station became Cheung Sha Wan, Cheung Sha Wan became Lai Chi Kok, and Lai Chi Kok became Lai Wan (later renamed as Mei Foo). When service of this line started, the section of the Kwun Tong line from Chater to Argyle (since renamed Central and Mong Kok stations respectively) was transferred to the Tsuen Wan line. Thus, Waterloo station (since renamed Yau Ma Tei station) became the terminus of the Kwun Tong line, and both Argyle and Prince Edward stations became interchange stations. This change was made because system planners expected the traffic of the Tsuen Wan line to exceed that of the Kwun Tong line. This forecast proved to be accurate, necessitating a bypass from the northwestern New Territories to Hong Kong Island. The Tung Chung line was therefore launched in 1998 with an interchange station at Lai King for that purpose. Although land acquisitions were made for a station at Tsuen Wan West, beyond Tsuen Wan station, as part of the Tsuen Wan branch, the station was never built. This is not to be confused with the modern-day Tsuen Wan West station on West Rail line, which lies on a newly reclaimed area near the former ferry pier. Since opening in 1982, the Tsuen Wan line is the line whose alignment has remained the same for the longest time. For example, the Kwun Tong line's alignment has changed twice since its opening—the taking over of Tsuen Wan line from Mong Kok to Central, and the taking over of Eastern Harbour Crossing section by the Tseung Kwan O line. Government approvals were granted for construction of the Island line in December 1980. Construction commenced in October 1981. On 31 May 1985, the Island Line was opened with service between Admiralty station and Chai Wan station. Both Admiralty and Central stations became interchange stations with the Tsuen Wan line. Furthermore, each train was extended to eight cars. On 23 May 1986, the Island line was extended to Sheung Wan station. Construction was delayed for one year, as government offices which were located over the station had to be moved before the construction could start. In 1984, the government approved the construction of the Eastern Harbour Crossing, a tunnel to be used by cars and MTR trains. The Kwun Tong line was extended across the harbour on 5 August 1989 to Quarry Bay station, which became an interchange station for the Kwun Tong line and the Island line. An intermediate station, Lam Tin, started operations on 1 October 1989. The Airport Express and Tung Chung line started services in 1998. The decision was made in October 1989 to construct a new international airport at Chek Lap Kok on Lantau Island to replace the overcrowded Kai Tak International Airport. The government invited the MTRC to build a train line, then known as the Lantau Airport Railway, to the airport. Construction started in November 1994, after the Chinese and British governments settled their financial and land disagreements. The new line was included in the financing plans of the new Hong Kong International Airport as the airport was not considered viable without direct public transport links. Construction costs were also shared by the MTRC, which was granted many large-scale developments in the construction plans for the new stations. The Lantau Airport Railway turned into two MTR lines, the Tung Chung line and the Airport Express. The Tung Chung line was officially opened on 21 June 1998 by Hong Kong Chief Executive Tung Chee-hwa, and service commenced the next day. The Airport Express opened for service on 6 July 1998 along with the new Hong Kong International Airport. The Airport Express also offers flight check-in facilities at Kowloon station and Hong Kong station—the in-town check-ins offer a more convenient and time-saving routine; a free shuttle bus service transports travellers from these stations to their respective hotels as well. Porters are also available to help transport luggage from and onto trains. It is the second most popular means of transport to the airport after buses. In 2012, it had a 21.8 per cent of share of the traffic to and from the airport. However, this has drastically declined from a peak of 32 per cent in 1999. The Quarry Bay Congestion Relief Works extended the Hong Kong Island end of the Kwun Tong line from Quarry Bay to North Point via a pair of 2.1-kilometre (1.3 mi) tunnels. The project was initiated due to overcrowding at Quarry Bay and persistent passenger complaints about the five-minute walk from the Island line platforms to the Kwun Tong line platform. Construction began in September 1997 and was completed in September 2001 at a cost of HK$3.1 billion. As with most earlier interchange stations, a cross-platform interchange arrangement was provided here in both directions. Construction of the Tseung Kwan O line (called the Tseung Kwan O extension line in the planning stage) was approved on 18 August 1998 to serve new housing developments. Construction began on 24 April 1999 and the line officially opened in 2002. It took over the existing Kwun Tong line tracks running through the Eastern Harbour Tunnel, so that the full line stretches from Po Lam to North Point. When the line was opened, the Kwun Tong line was diverted to Tiu Keng Leng on the new line. Construction costs were partly covered by the Hong Kong Government and private developers which linked construction of the Tseung Kwan O Line to new real estate and commercial developments. The interchange between the Tsuen Wan line and the Kwun Tong line, as well as that between the Kwun Tong line and the Tseung Kwan O line, are two stations long, allowing cross-platform interchange wherein a passenger leaves a train on one side of the platform and boards trains on the other side of the platform for another line. For example, when passengers are travelling on the Kwun Tong line towards Tiu Keng Leng, getting off at Yau Tong would allow them to switch trains across the platform for the Tseung Kwan O line towards North Point. Whereas, staying on the train and reaching Tiu Keng Leng would allow them to board the Tseung Kwan O Line trains towards Po Lam/LOHAS Park. This design makes interchanging more convenient and passengers do not have the need to change to different levels. However this interchange arrangement is not available for all transferring passengers at Kowloon Tong, Central, Hong Kong, Quarry Bay, Nam Cheong (except transfer between Tuen Mun and Hong Kong bound trains), Mei Foo, Tai Wai station (except alighting from Ma On Shan line to change to southbound trains for East Rail line) and Sunny Bay (except transfer between Tung Chung and Disneyland Resort bound trains) stations, mainly because this service is available only when there are two continuous stations shared as interchange stations by two lines. Two major works were undertaken to ease interchange between the Kwun Tong line and East Rail line. The modification of Kowloon Tong station started in June 2001. A new pedestrian link to Kowloon Tong Station southern concourse and a new entrance (Exit D) opened on 15 April 2004 to cope with the increase in interchange passenger flow. Modification to Tsim Sha Tsui station involved upgrading station facilities and concourse layout to facilitate access from the East Tsim Sha Tsui station via its pedestrian links. [Note 1] New entrances to the subway links were opened on 19 September 2004 (Exit G) and 30 March 2005 (Exit F), with the whole scheme completed in May 2005. The Disneyland Resort line, previously known as Penny's Bay Rail Link, provides service to the Hong Kong Disneyland Resort which was opened on 12 September 2005. Service to Sunny Bay station on the Tung Chung line started in 2005. The new line and the Disneyland Resort station opened on 1 August 2005. It is a 3.5-kilometre (2.2 mi) single-track railway that runs between Sunny Bay station and Disneyland Resort station. The Disneyland Resort station itself was designed to blend in with the ambiance of the resort. The line operates fully automated trains running every four to ten minutes without a driver. The carriages are refurbished M-train rolling stock to match the recreational and adventurous nature of the 3.5-minute journey. The AsiaWorld–Expo station is an extension of the Airport Express serving a new international exhibition centre, AsiaWorld–Expo, at Hong Kong International Airport. The station opened on 20 December 2005 along with the exhibition centre. To cope with the projected increase in patronage, Airport Express trains were lengthened to eight carriages from the previous seven. Additional trains are also deployed on the Tung Chung line during major exhibitions and events. On 5 October 2000 the operator of the MTR network, MTR Corporation (MTRCL), became Hong Kong's first rail company to be privatised, marking the beginning of the Hong Kong government's initiative to dissolve its interests in public utilities. Prior to its listing on the Hong Kong Stock Exchange, the Mass Transit Railway Corporation (MTRC) was wholly owned by the Hong Kong government. The offering involved the sale of about one billion shares, and the company now has the largest shareholder base of any company listed in Hong Kong. In June 2001, MTRCL was transferred to the Hang Seng Index. MTRCL has often developed properties next to stations to complement its already profitable railway business. Many recently built stations were incorporated into large housing estates or shopping complexes. For example, Tsing Yi station is built next to the Maritime Square shopping centre and directly underneath the Tierra Verde housing estate. On 11 April 2006, MTRCL signed a non-binding memorandum of understanding with the Hong Kong government, the owner of Kowloon–Canton Railway Corporation, to merge the operation of the two railway networks in Hong Kong in spite of the strong opposition by the KCRC staff. The minority shareholders of the corporation approved the proposal at an extraordinary general meeting on 9 October 2007, allowing MTRCL to take over the operation of the KCR network and combine the fare system of the two networks on 2 December 2007. On 2 December 2007 the Kowloon-Canton Railway Corporation (KCRC) granted a 50-year service concession (which may be extended) of the KCR network to MTRCL, in return for making annual payments to KCRC, thereby merging the railway operations of the two corporations under MTRCL's management. At the same time MTRCL changed its Chinese name from "地下鐵路有限公司" (Subway Limited Company) to "香港鐵路有限公司" (Hong Kong Railway Limited Company), but left its English name unchanged; at the same time the system's Chinese name changed from "地鐵" ("Subway") to "港鐵" ("Hong Kong Railway"). After the merger, the MTR network included three more lines—East Rail line, West Rail line, and Ma On Shan line—as well as the light rail network and Guangdong through train to Guangzhou. On 28 September 2008, fare zones of all urban lines, East Rail line, Ma On Shan Line and West Rail line were merged. A passenger could travel on these networks with only one ticket, except where a transfer is made between Tsim Sha Tsui and East Tsim Sha Tsui stations, where two tickets are required. Student discounts on Octopus Card were also issued. The MTR system has been extended numerous times since the railway merger. Relevant projects include the LOHAS Park spur line (2009), the Kowloon Southern Link (2009), the West Island Line (2014), the Kwun Tong line extension (2016), and the South Island line (2016). The LOHAS Park Spur Line is an extension of the Tseung Kwan O line, splitting off after Tseung Kwan O station. It serves the new residential development of LOHAS Park (formerly "Dream City"), a 3,550,000-square-foot (330,000 m2) estate with fifty residential towers. The project is divided into 9 to 13 phases and is about halfway complete as of 2016. These high rises sit above LOHAS Park station, which opened on 26 July 2009. The West Island Line, first put forward to the government on 21 January 2003, is an extension of the Island line. It serves the Western District of Hong Kong Island. The construction of the West Island Line started on 10 August 2009. Kennedy Town station and HKU station opened on 28 December 2014. Sai Ying Pun station opened later, on 29 March 2015, due to construction delays. A proposal to extend the existing Kwun Tong line to Whampoa Garden was made in April 2006 and approved in March 2008 as part of the bid for the Sha Tin to Central Link. Two new stations at Whampoa and Ho Man Tin opened on 23 October 2016. The South Island line opened on 28 December 2016 between Admiralty and South Horizons, linking the Southern District to the MTR for the first time. With the opening of the South Island Line, all 18 districts of Hong Kong are served by the MTR. Construction is underway to upgrade the existing infrastructure of the MTR. New subway links to the stations are also being made for better access. The South Island line (West) was part of the same original proposal as the South Island Line, and would connect HKU to Wong Chuk Hang around the west coast of Hong Kong Island, however construction has not started as of 2016[update]. The Sha Tin to Central Link project will create two new rail corridors upon completion. The Tai Wai to Hung Hom section is expected to be completed in 2019, connecting the Ma On Shan line and West Rail line to form the Tuen Ma line. The section from Hung Hom to Admiralty, across Victoria Harbour, is expected to be completed in 2021. This will be an extension of the East Rail line. The North Island line is a planned extension of the Tseung Kwan O line that will interchange at the future Tamar station with the Tung Chung line. It will alleviate traffic in the northern part of Hong Kong Island. There will be three new stations: Tamar, Exhibition Centre (which will be an interchange between the North Island line and the North South Corridor), and Causeway Bay North. Construction is expected to begin in 2021 and finish in 2026. The cost is estimated to be HK$20 billion in 2013 prices. The Northern Link is a proposed new line which connects Tuen Ma line with the Lok Ma Chau Spur Line of East Rail line. It also has Au Tau, Ngau Tam Mei, San Tin, a future interchange station between East Rail line and Northern Link, Kwu Tung, which will become a terminus for Northern link. The East Kowloon line would serve the East Kowloon area to Tseung Kwan O New Town via the hilly Sau Mau Ping residential area. The Tuen Ma line will be extended to Tuen Mun South station serving Tuen Mun South. The architecture of MTR stations is less artistic, instead focusing on structural practicability. With the high level of daily passenger traffic, facilities of the MTR stations are built with durability and accessibility in mind. After extensive retrofitting, the MTR system has become, in general, disabled-friendly—the trains have dedicated wheelchair space, the stations have special floor tiles to guide the blind safely on the platforms, and there are extra wide entry and exit gates for wheelchairs as well. Portable ramp for wheelchair users are available for boarding and alighting trains. On board the rolling stock, there are also flashing system maps on select trains while Active Line Diagrams and traditional route maps are installed on the others. Infopanels as well as on MTR In-Train TV onboard trains display important messages such as next station announcements as well as operational messages. 3G and LTE (4G) mobile phone network is in place throughout the MTR system of stations and tunnels allowing passengers to stay connected underground. Currently, full 3G network coverage in all stations and tunnels (except underground section on East Rail line and West Rail line) for the MTR system has been provided by 3 Hong Kong, SmarTone and PCCW. Passengers with subscription services will be able to make video calls and access high speed video content on their mobile phones regardless whether the train is above ground or under ground. The MTR has already extended the Wi-Fi service to all of the Airport Express trains and the expansion of the service to other MTR routes is still under consideration by MTR. All 93 stations on the MTR offer free Wi-Fi service to passengers with a limitation of 15 minutes per session and a maximum of five sessions per day. In late 2015 it was announced that all 400 payphones in the MTR system would be removed in early 2016. The contract with the service provider, Shinetown Telecom, was expiring, and the MTR Corporation said that no one had tendered a proposal to take over the contract. As a result, the MTR system no longer has payphones. When the system opened, public announcements were made in British English and in Cantonese by train captains and station staff. In the early 1990s the announcements were standardised, pre-recorded by RTHK presenter Dr Cheri Chan Yu-yan (Chinese: 陳如茵博士), who is now Assistant Professor of English Language Education at The University of Hong Kong and remains the voice of the MTR today. Since 2004, in order to accommodate Mainland Chinese visitors under the Individual Visit Scheme, Mandarin Chinese has been added to the repertory. Unlike many other metro systems around the world, "main line" MTR stations originally did not have toilet facilities available for public use. Passengers may use MTR staff toilets at all stations on request. In 2006, MTRCL said it would not consider retrofitting existing underground toilets, because of the challenge of installing new piping and toilet facilities. Only stations on the Airport Express and Disneyland Resort line had access to toilet facilities. All former KCR stations (on the East Rail line, West Rail line, and Ma On Shan line), merged into the MTR network in 2007, have public toilets. During the Legislative Council rail merger bill discussions, the MTR Corporation was criticised by legislators for their unwillingness to install toilets in main line stations. MTRCL indicated that it would carry out a review of the feasibility of installing public toilets at or in the vicinity of its above-ground railway stations. Discussions between the Government and MTRCL have taken into account LegCo members' request for a stronger commitment by the corporation to the provision of public toilets on new railway lines. This resulted in MTRCL agreeing to include the provision of toilets within, or adjacent to, stations in the overall design parameters for all future new railway lines, subject to planning and regulatory approval and any concerns raised by residents in the vicinity about the location of external ventilation exhausts. Toilets have since been retrofitted into several existing MTR stations, including Sheung Wan station, Ngau Tau Kok station, Quarry Bay station, Mong Kok station, Prince Edward station, and Admiralty station. In addition, newly opened stations such as those of the West Island Line have toilets. The MTR plans to install public toilets at all interchange stations by 2020. In late 2017 the MTR introduced breastfeeding rooms at 20 interchange stations. The rooms are located in back of house areas, and are available upon request to MTR staff. Prior to the privatisation of MTRC, MTR stations only had branches of the Hang Seng Bank, Maxim's Cakes stores, and a handful of other shops. Since then, the number and types of shops have increased at stations has increased, turning some of them into miniature shopping centres. ATMs and convenience stores are now commonplace. The MTR has contracted with publishers for the distribution of free magazines and newspapers in MTR stations. Recruit was the first free magazine which was solely distributed in stations (before railway merger) since July 1992, but the contract was terminated in July 2002. Another recruitment magazine Jiu Jik (招職), published by South China Morning Post, replaced Recruit as the only free recruitment magazine distributed in MTR stations bi-weekly. The Metropolis Daily (都市日報), published by Metro International, is the first free newspaper distributed free in MTR stations during weekdays (except public holidays); and in 2005, there is another weekend newspaper Express Post (快線週報), distributed every Saturday except public holidays. The Metropop (都市流行), a weekly magazine featuring cultural affairs and city trends also published by Metro International, started its distribution in MTR stations every Thursday since 27 April 2006, a few months after the termination of Hui Kai Guide (去街 Guide) in 2006. MTR Stations on ex-KCR lines feature two free Chinese-language newspapers, namely am730 and Headline Daily. MTR promotes reading of these newspapers by adding special coupons and promotion offers inside the newspapers, for example, a free trip to Lok Ma Chau or a free keyring. On the Kwun Tong line, East Rail line, Ma On Shan line and West Rail line, MTR In-Train TV is available. At various stations of the MTR network, the MTRCL (which took over from KCR) has set up feeder buses which enhance the convenience of taking the MTR. These bus routes, which normally consist of one to two stops, terminate at housing estates and go past major landmarks. The feeder bus routes on the East Rail line are run under the MTR name but are operated by Kowloon Motor Bus. Seven types of electric multiple unit rolling stock operate on the MTR network and four generations of light rail vehicles operate on the light rail network. All utilise either 1,432 mm (4 ft 8 3⁄8 in) rail gauge (near standard gauge) or 1,435 mm (4 ft 8 1⁄2 in) (standard gauge). Except for Airport Express trains, all trains are designed to cope with high patronage, for example, through seating arrangements, additional ventilation fans, and additional sets of extra-wide doors. These configurations allow the MTR to run at 101,000 passengers per hour per direction (p/h/d) on its busy suburban East Rail line and 85,000 p/h/d on its urban metro network. South Island line 3 2016 Driverless configuration. In three-car formation instead of eight cars. Also known as S-train. MLR East Rail line 12 5 (or 2 on First Class) 1982–1992 Modified 1996. Only one set of doors is used on first class normally. Known as M-trains, these are the oldest model of train in operation. M-Trains can be divided into different "stocks". The M-stock (or "CM-stock") of M-Train are the oldest trains on the MTR, built originally by Metro-Cammell (now Alstom) and refurbished by United Goninan. The M-train uses sliding doors, unlike K-stocks and Grupo CAF Trains which use plug doors. They are in service on Kwun Tong line, Tsuen Wan line, Island line and Tseung Kwan O line. The Disneyland Resort line uses driverless M-trains with their appearance overhauled to suit the atmosphere and theme of the line. Windows on each carriage and the handrails inside are made into the shape of Mickey Mouse's head, and there are bronze-made Disney characters decorating the interior of the carriages. The Tung Chung line and the Airport Express use CAF Trains tailored to their respective lines. Initially run in seven-car formations, they have now been lengthened to eight cars. These two variations are built jointly by Adtranz (now Bombardier Transportation) and Grupo CAF (CAF) between 1994–97. Since 2006, K-stock has also been used on the Tung Chung line. The K-stock was built jointly by Mitsubishi Heavy Industries and Hyundai Rotem and first put into service on the Kwun Tong line. Subsequently, in 2006, four additional sets joined the Tung Chung line to cope with the increasing passenger traffic. K-Stock trains have come under criticism when it was first put into service due to delays and door safety issues. There have been incidents where passengers have been injured by its doors and other service reliability issues have led to MTRCL "minimising the number of Korean trains for passenger service until a higher reliability of the systems concerned is achieved". The contract (C6554-07E) for 10 new sets of trains was awarded to Changchun Railway Vehicles Co. Limited in October 2008 with a further 12 trains ordered in the summer of 2011. These MTR trains were delivered to Hong Kong between 2011 and 2013 to enhance train frequency on the existing lines to cater for increased patronage on the Island line, Kwun Tong line, Tsuen Wan line and Tseung Kwan O line. These trains feature new 22" LCD TVs, like their counterpart trains on former-KCR lines equipped with MTR In-Train TV, offering infotainment such as news and announcements. The first of these trains entered revenue service on 7 December 2011 on the Kwun Tong line. The South Island line uses a similar train known as the S-train. Unlike the original C-train, the pantographs are on the A cars. All cars are powered, so there are no trailer cars. The S-train is also only three cars long and are driverless, with the driver's cab removed with space for passengers. However, the S-trains can still enable manual operation in the event of an emergency. Both East Rail line and West Rail line use the SP1900 while Ma On Shan line uses SP1950, a shorter model of the SP1900. The electrification system used on these lines is 25 kV AC, 50 Hz, as opposed to the 1.5–kV DC used on the urban lines. Should the need arise in the future, dual voltage trains such as those utilised on Oresund Bridge would be required. These two models of rolling stock are from the former KCRC network (KCR East Rail, West Rail and Ma On Shan Rail). They did not receive major changes after the merger of the two companies except for the updated route map, the exterior company logo and such. The capability of this EMU fleet is similar to those on the urban network. The older Metro Cammell EMUs are also used on East Rail line. There are 351 cars which have been built (29 sets + 3 surplus cars) since 1982. There are currently plans to replace these cars with new Hyundai Rotem EMUs (R-stock) between 2018–2020. This is part of the upgrade programme related to the new Shatin to Central Link. In December 2012, the MTRC announced that new contracts had been awarded to Hyundai Rotem for 37 new nine-car trains to be used on the Sha Tin to Central Link. These trains are expected to replace the Metro Cammell EMUs that currently run on the existing East Rail line. The new R-stock trains are wider than existing units and can accommodate more passengers per car; however, the length of each train will be cut from the current 12-car configuration used on the Metro Cammell and SP1900 EMUs to nine cars. This is due to space constraints imposed by new underground platforms on the Sha Tin to Central Link. MTR will also upgrade existing signalling systems used on the East Rail line which will enable trains to operate at two-minute headways on average, instead of the current three-minute interval, which the MTRC expects will be able to compensate for the loss of capacity resulting from the shorter trains. However, there are concerns from local residents that this will not be effective. Light rail rolling stock were ordered from three different manufacturers: Commonwealth Engineering (Comeng), Kawasaki Heavy Industries, United Goninan and CRRC Nanjing Puzhen. They are designed to run on the standard gauge and utilise 750 V DC delivered through overhead lines. Trains comprise one or two carriages, where the second carriage functions as only a trailer. The arrangement allows each car to carry approximately 300 passengers with 26 seats, while four sets of poach seats provide flexible riding for passengers. The light rail trains are being modernised as part of a 20th anniversary activity. Trains will include better disabled facilities as well as a totally new interior. The MTR will refurbish 69 older trains and buy 22 new ones. The first trains have been completed and were scheduled to be put into service in November 2009. The whole project is expected to be completed in 2011. The MTR Headquarters Building is located at Telford Plaza. It is a part of the larger Telford Garden complex, which was developed as part of a partnership between MTR and private development companies. Telford Plaza held an exhibition dedicated to the history of MTR in April 2014. After the rail merger, there are three different fare classes on the MTR: Adult, Students and Concessionary. Only children below the age of 12 and senior citizens 65 years or older are eligible for the concessionary rate on all lines. Full-time Hong Kong students between the ages of 12 and 25 qualify for the concessionary rate using a personalized Octopus Card on all lines except on Airport Express, or travel to or from cross-border stations (Lo Wu/Lok Ma Chau). Children below the age of 3 travel free (unless they exceed the height range). The fare of MTR between any two particular stations is not calculated using a particular formula, and must be looked up from the fare table. Fares for the Airport Express Line are significantly higher. Services to checkpoint termini are also more expensive than ordinary fares. Adult fares range from HK$3.6 to $52.6 (US$0.46–6.74). Concessionary fares are usually half the adult fare, and range from HK$1.50 to $27.00. Student fares are the same as child and elderly fare on the urban lines, but are the same as the Adult fares for journeys to or from checkpoint termini, and range from HK$1.50 to $51.00. The fare is subject to adjustment in June every year. Prior to May 2009, MTR did not provide concessionary fares for the disabled. Legislators such as social welfare constituency legislator Fernando Cheung Chiu-hung and those from Hong Kong's Association for Democracy and People's Livelihood had for years demanded that such concessions be put in place. In May 2009, MTR eventually agreed to offer the disabled concessionary fares with HK$2 million sponsorship from Transport and Housing Bureau and under the condition that Legislative Council amends the Disability Discrimination Ordinance. Single journey tickets can be purchased at vending machines while tourist passes, Octopus cards and other special tickets must be purchased at the ticket counter. Credit cards are only accepted to purchase Airport Express tickets and tourist Octopus cards from automatic vending machines located within Hong Kong airport. The Octopus card is a rechargeable contactless smart card used in an electronic payment system in Hong Kong developed by Australian company ERG Group. It was launched in September 1997 for use on the MTR (and KCR, now operated by MTR) and now is the most widely used electronic cash system for transactions in Hong Kong as many retailers (including supermarkets, car parks and fast food outlets) are fitted with readers. The technology used was Sony's Felica line of smartcard. The Octopus card uses radio frequency identification (RFID) technology so that users need only hold the card in front of the reader, without taking it out of handbags and wallets. Except for the Airport Express, MTR fares are slightly lower when using an Octopus card compared to using single journey tickets. For example, the cost of the three-minute journey from Admiralty to Tsim Sha Tsui across the Victoria Harbour is (as of January 2018) HK$9.7 using the Octopus card, compared with HK$10.5 for a single-journey ticket. Also, in order to have fare discounts and promotions, say Monthly Pass and MTR Club Bonus Points Scheme, passenger are required to hold an Octopus Card. The Tourist Day Pass gives tourists unlimited MTR rides for one day (with the exception of MTR Bus routes, the First Class of the East Rail line, the Airport Express, as well as journeys to and from Lo Wu, Lok Ma Chau and Racecourse stations). Each pass costs HK$55 and are available at all the MTR Customer Service Centres. Tourist Day Pass must be used within 30 days upon the day of issue. The Airport Express Tourist Octopus Cards are also available. Cardholders may enjoy three days of unlimited rides on the MTR (except Airport Express, East Rail line First Class, Lo Wu and Lok Ma Chau stations) refundable deposit of HK$50 and choice of either a single (HK$220) or round trip (HK$300) on the Airport Express. A touchless smart card system is used for single journey tickets. These tickets are pre-paid for between pre-determined stations, and are good for only one trip. There are no return tickets, except on the Airport Express. As of mid-2013, less than 5 per cent of MTR customers travelled on single journey tickets. Fares for the Airport Express are substantially different from main line fares. Apart from single tickets, same-day return tickets (same price as a single), and one-month return tickets are also available. A one-day pass can be used for unlimited travel to and from Hong Kong Disneyland within the same day, and costs HK$50. This pass can be purchased from any MTR Customer Service Centres or Airport Express Customer Service Centres. The Ticket Suggestion function is developed by MTR alongside with Route Suggestion on MTR website. Based on user's journey and travel pattern, it can recommend the most fare-saving ticket type for daily and non-daily commuters. Apart from official application, third parties, such as MTR Service Update, have been developed their own ticket recommendation, claiming to be more user-friendly and fare-saving. The Checkfare of MTR Service Update can recommend user whether to interchange at Tsim Sha Tsui/ East Tsim Sha Tsui, in order to receive more discount. . Since the merger in 2007, MTR has consistently achieved a 99.9 per cent on-time rate, meaning 999 of every 1,000 passengers arrives at their destination within 5 minutes of scheduled time. In 2013, out of the 5.2 million passengers the MTR averaged each workday, 5.195 million passengers were considered to have arrived "on time". This makes MTR one of the most efficient rapid transit systems on the planet. MTR must report all delays of more than eight minutes to the government. There were 143 reportable incidents in 2013. MTR is fined HK$1 million for having delays of 31 minutes to an hour, with higher fines for longer delays. According to the Mass Transit Railway By-laws, eating, drinking, or smoking are not allowed in the paid area of stations or in trains. Offenders will be fined up to HK$5000. Various campaigns and activities are taken to help ensure that the MTR is a safe system to travel on. Poster campaigns displaying information on topics such as escalator safety are a common sight in all MTR stations, and announcements are made regularly as safety reminders to travelling passengers. Bylaws were also introduced to deter potentially dangerous actions on the MTR, such as the ban on flammable goods on the MTR and rushing into trains when the doors are closing. Penalties ranging from fines to imprisonment have been imposed for such offences. Police officers patrol the trains and stations, and police posts are available at some stations. The Hong Kong Police Force has a Railway District responsible for the MTR. Closed-circuit television cameras are installed in stations and on some of the newer trains. The entire Tung Chung line and Airport Express, as well those stations added by the Tseung Kwan O Line, has platform screen doors (PSDs), ordered from Swiss glass door manufacturer Kaba Gilgen AG, installed upon construction. So does the entire West Rail line (except Hung Hom station), inherited from KCR. These doors make platforms safer by preventing people from falling onto the rails, even though MTRCL did not heavily promote it directly. However, the primary motivation was to separate the stations from the tunnels, hence allowing substantial energy savings on station air-conditioning and tunnel ventilation. Automatic platform gates (APGs) have also been installed at the Sunny Bay and Disneyland Resort stations. Their heights are half of the PSDs and only prevent people from falling onto the rails. MTR has finished installing the APGs on all of the above-ground stations of the MTR except on the East Rail and Ma On Shan lines; they will be installed there as part of the Sha Tin to Central Link project. In June 2000, MTRCL proceeded with its plans to retrofit 2,960 pairs of platform screen doors at all 30 underground stations on the Kwun Tong line, Tsuen Wan line, and Island Line in a six-year programme. The programme made MTR the world's first railway to undertake the retrofitting of PSDs on a passenger-carrying system already in operation. A prototype design was first introduced at Choi Hung station in the 3rd quarter of 2001. The whole installation scheme was completed in October 2005, ahead of the forecast completion date in 2006. MTRCL said that part of the cost had to be assumed by passengers. HK$0.10 per passenger trip was levied on Octopus card users to help fund the HK$2 billion retrofit programme. This levy was ended in 2013 after raising more than HK$1 billion. The MTR visual identity, which includes logo, vehicle livery, signage, route maps and passenger information, was updated in 1995–1998 by Lloyd Northover, the British design consultancy founded by John Lloyd and Jim Northover. With the objective "not only bring MTR passengers more time for life, but also more time for art", the Art in MTR Initiative has been a success since its reception in 1998, where the Airport Express Artwork Programme was the pioneer project. Thereafter, live performances, art exhibitions, display of artwork by established and emerging artists, students and young children have been brought into the MTR stations. MTRCL have even made art part of the station architecture when building new stations or renovating existing ones. Artworks are exhibited in different forms on the network, including "arttube", open art gallery, community art galleries, roving art, living art, and art in station architecture. MTR and Hong Kong Amateur Athletic Association have jointly hosted MTR Hong Kong Race Walking annually in spring since 2005. The race walking competition aims at promoting healthy living in Hong Kong. The race begins and ends on the ground above Central MTR station, namely Chater Garden, Chater Road, Ice House Street and Des Voeux Road Central in Central. There is a fun walk apart from the regular competition. The event attracted over 800 participants in 2005 and 1,500 in 2012. The event is attended not only by Hongkongers, but also athletes from various countries. The race raises fund for Better Health for a Better Hong Kong, a Hospital Authority project for the working population. The MTR Corporation came under fire in June 2011 after their work on the cross-border high-speed railway line encroached on a conservation area in Pat Heung, Yuen Long. 34 trees were felled and an entire slope was concreted over in the conservation area. The Environmental Protection Department issued summonses to the corporation for offences under the Environmental Impact Assessment Ordinance. In September 2011, a fine of HK$15,000 was imposed by the court. The MTR Corporation admitted that 34 trees were felled by mistake; all were common native woodland species and no rare tree species were affected. The corporation said owing to a technical misalignment of relevant drawings, the plan submitted to the Environmental Protection Department did not include the part of the Conservation Area which was included in the gazettal plan of their works. The corporation became aware that part of the approved tree removal works may have encroached onto the Conservation Area during construction, and proactively reported the situation to the government. Evaluation and measures have been taken to prevent similar incidents from happening again. The MTR Corporation came under fire again in September 2011 after felling dozens of trees in Admiralty as part of construction work for the South Island line. Green activists denounced the tree felling as "unprofessional", and Ken So Kwok-yin, chief executive of the Conservancy Association and a certified tree arborist, said that the explanations offered by the MTR Corporation as to why the trees were felled were "unacceptable". The MTR Corporation is felling approximately 4,000 trees for the construction of the South Island line, raising concerns from environmental groups and the public about its commitment to protecting Hong Kong's natural environment. The corporation has limits on the size of items allowed on trains. The MTR system is facing pressure from increasing numbers of parallel traders who carry oversized baggage onto trains for resale in China. The corporation has been criticised for allowing parallel traders to board trains with massive bags, causing undue congestion and inconvenience to residents of the North District. Furthermore, the corporation accused of double standards in enforcement when images of cross-border smugglers pushing overladen trollies appeared on social network sites on a regular basis, whilst local students carrying large musical instruments were reported to have been stopped and issued with written warnings. Leading musicians joined in the criticism of MTR's unreasonable stance on large instruments; some citizens invited players of cellos and other large instruments to congregate on 3 October 2015 with their equipment at Tai Wai station, where the majority of these instances occurred. Following the public uproar, MTR issued a press release in the early hours acknowledging discontent and announcing a one-month review of the policy on oversized items to see whether there was room for fine-tuning that would not compromise on passenger safety. The corporation said that staff would continue executing existing policy until any revisions are made. On 16 October 2018, four MTR lines suffered delays simultaneously, an unprecedented disruption to railway services. MTR stated that initial investigations showed that the problems were related to the computers that control the signalling system, and an in-depth investigation would be carried out. This page is based on the Wikipedia article MTR; it is used under the Creative Commons Attribution-ShareAlike 3.0 Unported License (CC-BY-SA). You may redistribute it, verbatim or modified, providing that you comply with the terms of the CC-BY-SA.